The Holley Metering Blocks and Metering Block Conversion kits are offered in the standard "gold" Dichromate or shiny "zinc" finish. 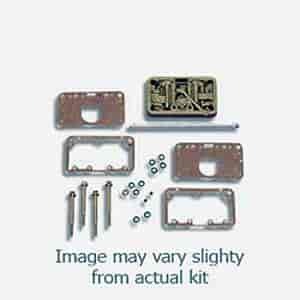 The conversion kits will convert almost any 4160 carburetor to a 4150, which upgrades the carburetor and comes in handy for secondary tuning at the track. The metering blocks are intended for replacement or upgrade and fuel bowls are not included. However, all necessary screws and gaskets are included where applicable.